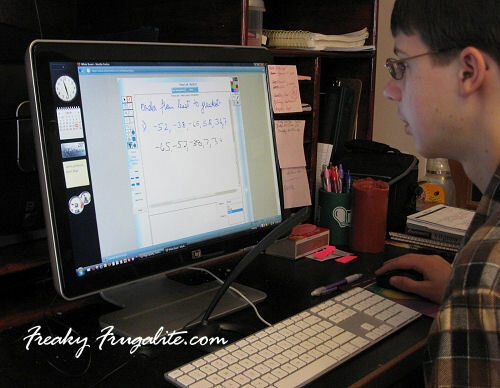 I recently had the opportunity to check out the Click and Climb online math tutoring service. I’ve never experienced online tutoring (or any tutoring, for that matter) and wanted to give it a go. Click and Climb specializes in mathematics, although I hear they will be adding other subjects soon. Mathematics is perhaps the most difficult subject to teach (I admit that I don’t even understand mathematics AT ALL! ), so even if Click and Climb never added anything else, I think they’ve cornered the market for online tutoring. First impressions: Um… how many times can I say WOW! The whole service was a breeze to set up, and the folks at Click and Climb (Aish and Meeta) went completely out of their way to answer my questions and help me set up the service. Speakers and a microphone, OR a headset with microphone. Internet Explorer or Firefox browser. It didin’t cost me a cent to start it up. I already had the microphone and the speakers (I decided against the headset, because I wanted to listen in on the math sessions, too!). And we already have Firefox (a free browser) and Skype (a free chat/Internet telephone program). Skype is very, very cool. I use it for instant messaging, but this was my first time using it for VOIP (Voice over Internet Protocol). It worked incredibly well, was so easy to use, and the quality was great. Plus, it was FREE! 😀 I’m hooked! The initial setup for Click and Climb was by a welcome email and “real” telephone calls from the Click and Climb folks. A pleasant man named Aish explained the program to me, helped show me the online whiteboard that they use (it looks a lot like Microsoft Paint), and chatted about homeschooling and math tutoring. I found out that Click and Climb is based in Boston, Massachusetts. Aish also set me up with a schedule– the next phone call would be from a lady named Meeta, the scheduling associate. Meeta was extremely punctual. 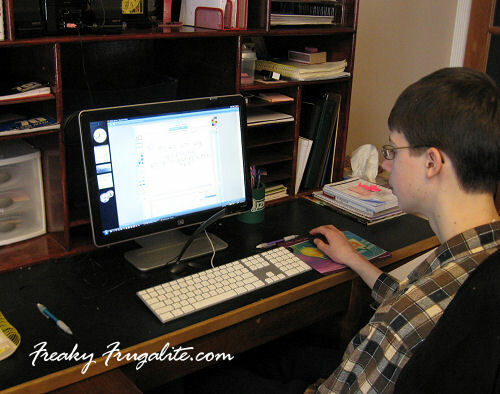 On the phone, she set up a schedule for the tutor and my son, who would be starting pre-Algebra. I said that my son (nicknamed Beetle Bailey for my blogs, by the way) was not taking any math at the moment, but we were going to start him on the pre-Algebra soon. I just wanted some preliminary sessions for him, to review some concepts to prepare him for pre-A. Meeta said that Click and Climb could certainly handle our “free range” style of homeschooling. Click and Climb does have copies of many school textbooks at hand; but if they didn’t have a certain one, the parent can scan the page of their textbook and email it to the tutor who could go over the page with the student (I was really impressed with that). But they were also able to go with my request of a more free-style math course. I was also impressed with the fact that Meeta took a little time to ask me about my son: what kind of a student he was, did he have any special needs or talents, etc. The personal element was a very nice touch. I told Meeta that Beetle Bailey was good at math, but he was not a talkative person. Once he understood a concept, he remembered it very easily. She took notes with the intention of passing this information on to Beetle Bailey’s tutor. We scheduled his sessions (she was very flexible with my schedule) with the tutor. I was also impressed with the consistency of the program- scheduled sessions are usually around the same time, and they are always with the SAME tutor. This is very important, I think, and I was glad to see Click and Climb think so, too. This way, the tutor and student build a relationship– the tutor comes to realize the student’s strengths and weaknesses, and the student learns to trust and open up to the tutor and his instruction. Next step was to check out the Click and Climb website, logon, and show Beetle Bailey how to use the whiteboard. Being familiar with Paint, he took to it right away. Then, we got our first call from our tutor, Dhiraj. Dhiraj is from India, and while his English was impeccable, we found it difficult to accustom to his accent at first. My son was able to adjust quicker than I– by the second session, they were chatting without difficulty. Dhiraj obviously is a total BRAIN at math. Click and Climb hires only certified teachers with Master’s or Bachelor’s degrees, and undergo training at Click and Climb. Oh, how I wish I’d had math tutoring as a kid, I wouldn’t be so stupid in math as an adult! I took a video of a few sessions, so you can see how things operated. The video is a tad long (3 minutes) but it really gives you an idea of how Click and Climb works. I love it! I’m VERY impressed with Click and Climb. I highly recommend it. When I first started homeschooling, I bought a lot of videos and computer software to teach the kids their mathematics… but the kids never really “caught on” with that stuff. Mathematics is a tough subject, and I think kids need a tutor to push them and challenge them, and to be able to STOP and EXPLAIN a concept if the kid struggles. You just don’t get that in any video or DVD or software program. I could kick myself, because I wasted hundreds of $$ on all that useless stuff. Click and Climb costs anywhere from $17.99 per session to $200 a month for 20 sessions. They also offer a revved-up SAT Preparation service (which I may try on my eldest daughter). For my son, we went with the one session a week trial, and that worked out well. The tutor can give assignments throughout the week, too. So it depends on your needs, really. Click and Climb is offering a trial month of 2 free sessions. Its worth every penny, because private tutors coming to your home can cost as much as $100 AN HOUR! Here in New York, private tutoring runs about $75 an hour, yikes. With Click and Climb, there’s no driving, no vacuuming the floors before the tutor arrives, no big bills! And the folks at Click and Climb bent over backwards to accommodate us. Check it out: Click and Climb.com or call 1-800-671-1376.